Communication partner germany - artLABOR e.V. evidenced by this certificate is authentic. has the non-exclusive licence to copy and multiply the artwork for a period of 12 month. Any copying or multiplying has to be marked with the copyright_sign ©. Unauthorized use is strictly forbidden. belegt durch das vorliegende zertifikat, authentisch ist. hat fuer einen zeitraum von 12 monaten das nicht-exklusive recht, das kunstwerk zu kopieren und multiplizieren. 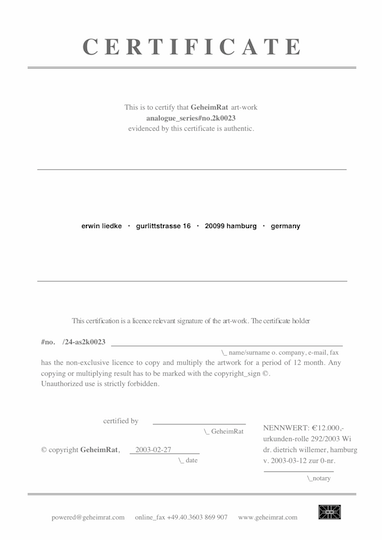 Jedes kopieren oder multiplizieren muss mit dem copyright-zeichen © gekennzeichnet werden. Unauthorisierte nutzung ist strengstens untersagt.